December 7, 2015, Rybinsk. - In 2015, Russia’s Ministry of Energy decreed to conduct an All-Russian contest among the projects implemented in the field of power saving, improvement of energy efficiency and power engineering development. The second All-Russian competition was timed to the international ENES 2015 energy efficiency and power saving forum. 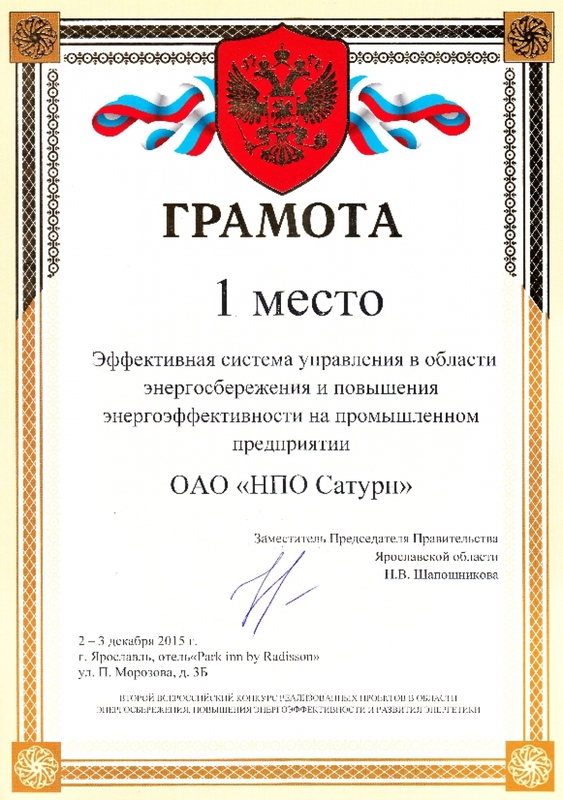 The project presented by NPO Saturn won the first place in the Yaroslavl Region in the nomination “The best project in power saving and energy efficiency improvement at a major industrial company”, in subnomination “Effective management system in the field of power saving and energy efficiency improvement at a major industrial company”. On December 2, in the frame of the Yaroslavl energy forum a solemn winner awards ceremony took place. The ceremony was attended by A. Knyazkov, head of the Yaroslavl regional government, N. Shaposhnikova, deputy governor of the Yaroslavl Region and I. Fedder, director of the Energy Efficiency Foundation nonprofit organization. The NPO Saturn Research and Production Association (OJSC) is an engine-manufacturing company specialized in the design and development, production, and after-market support of gas turbine engines for military and commercial aviation, naval ships, and power-generating plants and gas-pumping units. The association is part of the Union of Russian Mechanical Engineers, an All-Russian public organization. NPO Saturn is part of United Engine Corporation (JSC) and acts as the leader of the Commercial Engines Division, a business unit of UEC founded on 09.10.2012 as a result of integration of the following companies: NPO Saturn (OJSC), Aviadvigatel (OJSC), PMZ (OJSC), Metallist-PM (CJSC), Energetik-PM (OJSC), Motoservis-PM (CJSC), and Zheleznodorozhnik-PM (CJSC). United Engine Corporation (JSC) (a Rostec State Corporation company) is an integrated organization specialized in the design and development, serial production, and after-market support of the engines for military and commercial aviation, space programs, the Navy, as well as for the oil and gas industry, and power generation. One of UEC’s prioritized fields of activity is the implementation of comprehensive programs of development of the companies in the industry by introducing new technologies meeting the world-class standards. In 2014 revenues of the corporation amounted to RUB 199.9 billion. The Rostec State Corporation is a Russian corporation established in 2007 in order to facilitate the development, manufacturing, and export of high-technology industrial products of military and commercial application. Today, it comprises over 700 companies, which form 9 defense-industrial and 5 civil industry holdings, as well as 22 direct control companies. The Rostec portfolio includes such renowned brands as AVTOVAZ, KAMAZ, Russian Helicopters, VSMPO-AVISMA, etc. Rostec’s subsidiaries are located in 60 regions of Russia and deliver their products to over 70 countries worldwide. In 2013 revenues of the corporation amounted to RUB 1.04 trillion. Total taxation exceeded RUB 138 billion.